The processing of data is taking on more importance in manufacturing and logistics – especially with digitization and automation on the rise. It is therefore inevitable to gather data reliably. Data entry must be error-free and as simple as possible. Information must be recorded in real time, around the clock and at the point where the data is generated – even in the harshest environments. That way you are able to drive efficient and factual analyses. Focusing on your companies own value added chain and production. Save resources by increasing process transparency and reducing redundancy. Increase your efficiency with shorter production and inspection times. Improve the quality and reliability of your products by identifying and sorting out defective parts at an early stage. Use your improved decision-making tools for a more effective planning and gain competitive advantages. There is a lot of potential in your data. 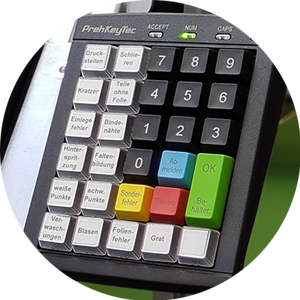 Make the most of it – with the manufacturing and logistic solutions from PrehKeyTec. Reliable: Because one downtime is one too many. Flexible: Due to free programmability, keyboards can be customized individually to increase productivity. Rugged: Our silicone keyboards work flawlessly even under the toughest conditions. Illuminated: The built-in LEDs make it easy to work in the dark and in low light areas. Simple: The operation of our rugged keyboards is easy – even while wearing working gloves. Glass keyboards have a flat surface that is resistant to acid, hand perspiration, dust and fluids. They are perfect for hygienic environments and can be operated with thin latex gloves. Full travel keyboards are durable, ergonomic, robust and IP54 protected. 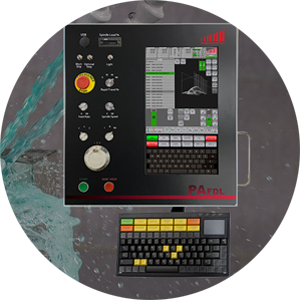 With their programmability and their customizable key layouts, they provide individual solutions for every application. Multi-functional readers are used in the logistics and manufacturing industry for authentication and identification. Our solutions are characterized by their high ergonomics and reliability and can be integrated within our other data entry solutions. >> We adapt our data entry solutions to your needs.